Though their presence is often welcome and most people like to see and hear birds, they can also act as pests for property owners. One of the major problems with birds is that they leave their droppings indiscriminately all over the place. Nobody wants to be the person on whom the bird drops. But guano droppings can also lead to the spread of disease. -> Diseases such as histoplasmosis, candidiasis, cryptococcosis, St. Louis Encephalitis, Salmonellosis have their source in the droppings of birds such as pigeons, starlings, sparrows, finches, and many others. These diseases mostly affect the respiratory system, but can also lead to other complications. -> The nutrient-rich droppings attract flies, lice, ticks, mosquitoes, and fleas, which in their turn carry diseases, infecting the people around them. -> A third way in which birds spread diseases is by birds feeding on infected waste and then deposit the organisms on your property via their guano. There are ways to bird-proof your property, but even so bird droppings can find their way in. The parasites in the guano continue to thrive even after the droppings are old and dry. Hence, these health concerns must be immediately dealt with by periodical and thorough guano removal and cleaning of the property to avoid the spread of disease. Birds also leave other kinds of waste that can spread diseases, or they simply make the property really dirty. Fouling, abandoned nesting material and dead birds also prove to be a health hazard and must be avoided. It is inadvisable to try to handle this cleaning yourself since bird waste and bird droppings can be found in cramped spaces, roofs, at great heights, etc., where it is not feasible for an inexperienced person to climb and clean. Our team is experienced in the removal of these wastes from the property. We ensure the safety of both our workers and your property by adhering to strict health and safety standards. Guano removal is also advisable because it can give a disgusting look to the place. 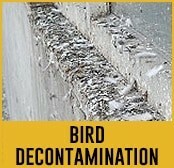 We undertake a full and complete analysis of what tasks are required to be completed for the bird decontamination process. We also conduct risk assessment and ensure that our policies are fully compliant with all Health and Safety regulations under the law. It is not just enough to clean up the property and remove all the bird waste from the property. Guano removal and bird decontamination are the main part of the process, but even more important is to ensure that there is no risk left of the diseases spreading from the organisms that might be left behind. Since parasites cannot often be seen by the naked eye, this always poses a risk. Hence, we also perform a thorough disinfection after the cleaning to check the spread of diseases. All the cleaning and disinfection products we use are in compliance with the safety, health and environmental regulations. If you fear birds have taken over your property, call us for an estimate.